Ramblings on books, Madras heritage, and other interesting events spanning two centuries. . .
All views expressed (by me) in this blog are mine, it does not represent that of the organisation where am employed. So, there is no association binding the employer with the opinions / writings in this blog. Image Courtesy: http://newspapers.nl.sg. Image's copyright ownership is with National Library, Singapore. 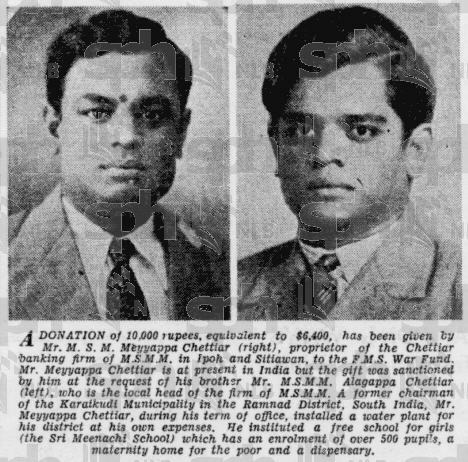 "A DONATION OF 10,000 rupees, equivalent to $6,400 has been given by Mr.M.S.M.Meyyappa Chettiar (right), proprietor of the Chettiar banking firm of M.S.M.M. in Ipoh அண்ட் Sitiawan, to the F.M.S War Fund. Mr.Meyyappa Chettiar is at present in India but the gift was sanctioned by him at the request of his brother Mr.M.S.M.M.Alagappa Chettiar (left), who is the local head of the firm of M.S.M.M. A former chariman of the Karaikudi Municipality in the Ramnad District, South India, Mr.Meyyappa Chettiar, during his term of office, installed a water plant for his district at his own expenses. He instituted a free school for girls (the Sri Meenachi School) which has an enrolment of over 500 pupils, a maternity home for the poor and a dispensary".